reservation, but we cannot guarantee being able to take you if you do not book in advance. Tuesday 12th September: Walk from Pentrich Village. Length & Grading: 5 miles, Moderate. customer (The Dog - Tel. 01773 513360). Starting Point: The Dog Inn, Main Road, Pentrich DE5 3RE. Grid Ref: SK 390 525. Start Time: 10am. Finish: 1pm. Length & Grading: 4 miles, Easy/Moderate. Starting Point: Outside Town Hall Entrance, Ripley Market Place DE5 3BT. Grid Ref: SK 399 505. 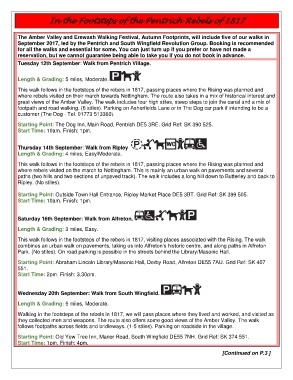 Saturday 16th September: Walk from Alfreton. Length & Grading: 3 miles, Easy. Park. (No stiles). On road parking is possible in the streets behind the Library/Masonic Hall. Start Time: 2pm. Finish: 3.30pm. Wednesday 20th September: Walk from South Wingfield. follows footpaths across fields and bridleways. (1-5 stiles). Parking on roadside in the village. Starting Point: Old Yew Tree Inn, Manor Road, South Wingfield DE55 7NH. Grid Ref: SK 374 551. Start Time: 1pm. Finish: 4pm.